Mystery Bags are coming  and some lucky purchasers will get a truly wonderful paintable doll prop! Our Mystery Bag Sale is COMING SOON and we're busy collecting beautiful materials to include in those bags. Here's our latest PAINTING PLASTIC tutorial  turning a dollar store plastic toy into an antique, enameled grocery scale for dolls. Want to make your own? Seven lucky multi-Mystery Bag purchasers will find one of these toys in their shipping box! Both "Lee" and "Pearl" are scouring workrooms and storerooms, gathering all kinds of exciting materials for the COMING SOON Mystery Bag Sale. We've collected fabrics, velvets, trims, faux fur, faux leather  and real leather from a recent Tandy HQ anniversary sale  beads, vinyl and even some hard-to-find thermoplastics from a theatrical supplier we visited in North Hollywood after a trip to Costume College. We're also planning a special treat for anyone who buys more than one Mystery Bag. As multiple-bag purchases can be shipped in a Priority Mail BOX instead of a padded envelope, we'll have room to tuck in some exciting non-fabric items from our prop and craft bins. We're sure these little pink scales from Japanese dollar store DAISO will be a favorite find in those multi-bag boxes, and we're going to show you why! One of the things we've noticed from our past experiments with painting dollar store toys and other inexpensive plastic doll-scale accessories, is that the mold work is typically of a much higher quality than the surface finish. This makes sense, as one mold will suffice for the entire line, while surface finishes have to be applied to each individual toy. Time and money can be spent getting the mold right, even if little further effort is applied to the toys themselves. Let's face it  the pink plastic and stickers on that grocery scale don't do much, do they? But because of the quality of the mold, toys like this PAINT beautifully. And in fact, this toy did paint beautifully. Hard to believe that's the same item. You want one now, don't you? 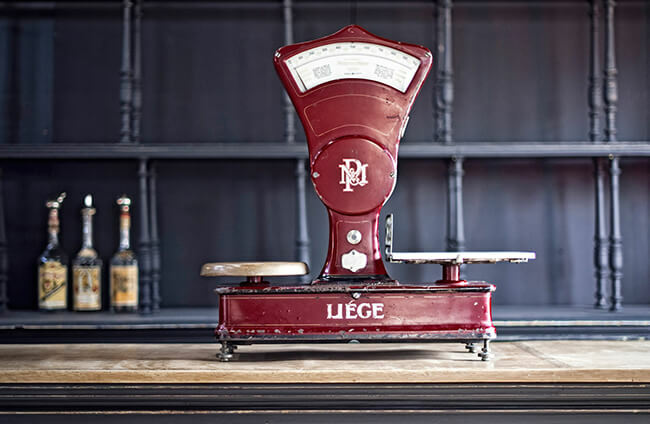 To get this look just right, Pearl researched antique grocery scales on Pinterest and settled on a somewhat worn, red-enamel-over-iron look  like these beauties. And now, we're going to tell you exactly how we re-created that look. and finally, Lumière Light Body Metallic Acrylic in Crimson for the red enamel finish. Also have on hand small and medium rectangular paint brushes and small squares of microfiber toweling to apply the primer, paints and finishes  and a scrap of dry paper towel to scratch/rub off the red coat in the final step, revealing the metallic black "iron" underneath. Before painting, remove the tiny screws on the back of the toy with a small screwdriver, and open the scale enough to slide off the clear plastic enclosure around the scale display. Put the tiny screws and the clear plastic enclosure in a baggie and set them carefully aside. Detach the scale needle  which really works  from its geared assembly, and remove all stickers, cleaning off any residue. Now, you're ready to paint! Using a small rectangular brush, apply TWO COATS of gesso primer to the entire piece, inside and out  and to the scale needle. Let the first coat dry before you apply the second coat. Apply the black acrylic paint to the base of the scale and the scale needle, and the silver metallic paint to the scoop. Apply a second coat of each if needed. To make the black paint look like metal, apply Haematite Inka Gold Rub to a small square of microfiber toweling and lightly brush it over the black base. (Do NOT rub it on the interior parts or on the scale needle, as you want those areas to remain matte black.) Then, with a clean square of toweling, buff the surface to a nice shine. Finally, paint over the metallic black areas with the crimson paint. Before the paint dries, use a scrap of dry paper towel to lightly rub and scratch off the red along the edges of raised and curved areas, and anywhere else that long years of use might have worn away an enamel finish on an antique scale  revealing the black metal underneath. Finish by replacing the original curved sticker under the needle with a new, more vintage-appropriate sticker (we'll include a copy of our sticker with the scales we send out in Mystery Bag boxes). Then carefully re-attach the needle, make sure all the parts still move freely, slide the clear plastic enclosure back in place, and return the tiny screws to their proper positions on the back of the scale. We love our antique-look scale for American Girls Kit or Nanea. We also think that the red is perfect for holiday displays  and made that little stack of poly clay linzer cookies from a YouTube tutorial to go with it. But since we saw the recent leaks of potential American Girl® Girl of the Year 2019 Blaire Wilson and her farm-and-garden themed accessories we've been tempted to try one next in robin's egg blue or soft green to match her color scheme. 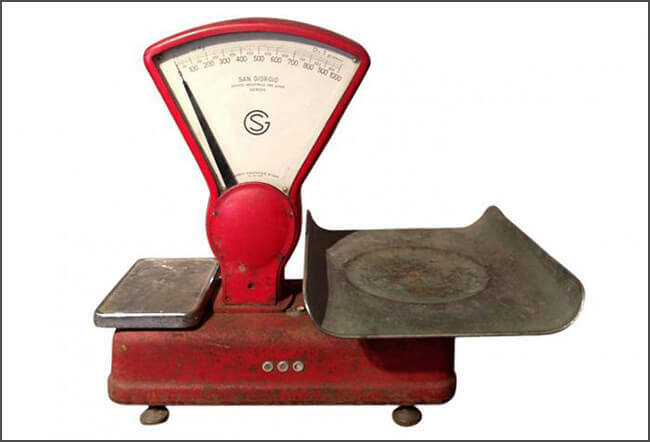 Unfortunately for us, we plan to give away our entire remaining stock of these scales during the Mystery Bag sale. 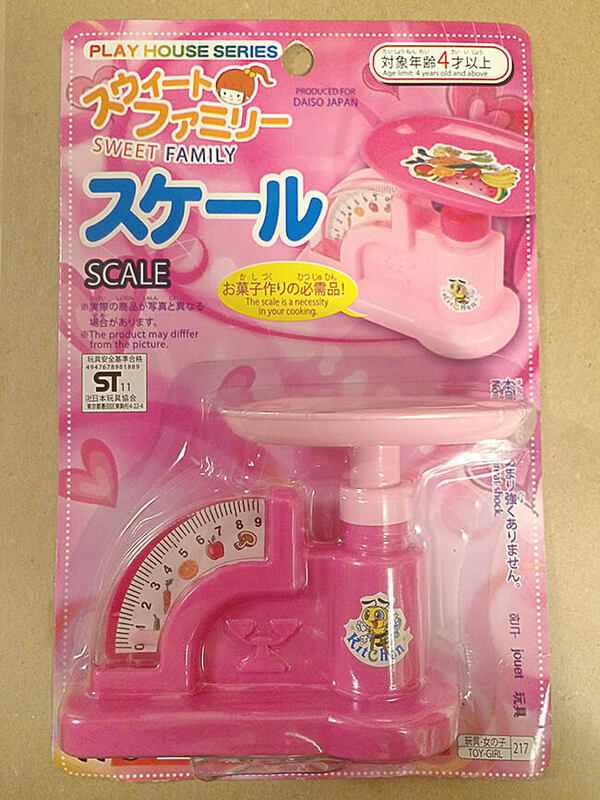 We only have SEVEN of these scales, and DAISO no longer makes them. Those seven will be in the first seven multi-bag orders we receive, and then they're gone. If you get one, and paint it to match Blaire and her farm accessories, please send us a picture. We'd love to see it.